that will need to be cleaned off. 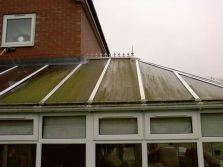 Most conservatory roof cleaning can be carried out from ground level with telescopic poles fully extended with an attached water feed. the water fed pole pure water system will shift most of the dirt although stubborn stains may need to be gently scrubbed before rinsing in clean water. 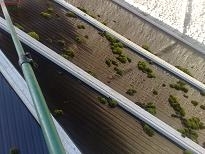 You will need to be more careful cleaning a polycarbonate roof than a glass one. Common household cleaners can damage the chemical coatings the manufacturer may have applied to shield it from the UV rays. 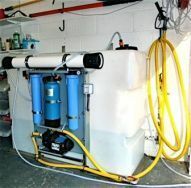 What is the Water Fed Pole System? 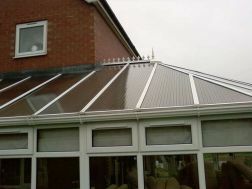 What are the advantages of having your Conservatory cleaned with poles? There are many. 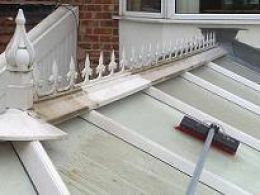 As already discussed, your frames and sills are cleaned as well as the glass every time you have a clean. 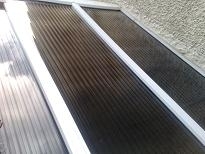 The Glass & UPVC stays cleaner longer due to having no washing liquid residue or chemicals etc left in the frames. The system also works brilliantly in the rain enabling regular cleaning all year round, keeping your Conservatory in Tip Top condition! 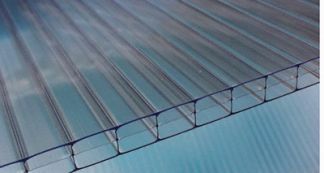 Your frames are safe too, from potential damage when ladders are rested against them to allow access to the Conservatory Roof. Then there's the bottom of the ladder. No more six inch deep ladder holes in your lawn and flower beds! Last but not least, because there are no chemicals involved, water fed poles are better for the environment. 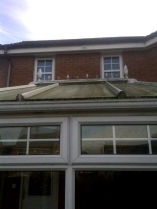 With our specialist unique washing system we can offer an external conservatory wash for very little money. 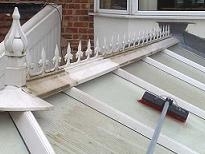 Ideally this wash is carried out every 6 months and will keep the conservatories like new. 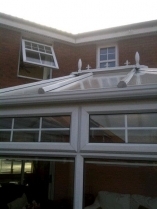 we provide specialist cleaning service for all types of conservatories and sealed windows making the structure look almost new again in many cases. Keeping a conservatory roof clean requires specialist equipment and our specialists are fully equipped with pure water applied at low pressure with specialist equipment ensuring that no damage will be caused to your conservatory. we can reach up to 45ft with our specialist equipment and in most cases they do not need to use scaffolding. 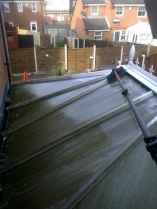 With water fed poles there is no problem and the risks are eliminated, we can clean your conservatory roofs from the ground, we can reach all areas of your glass roof leaving it sparkling clean, conservatory's can be done in a much quicker time as well using water fed poles instead of traditional methods.